Happy Camp is the type of town where you know you would really like to live. Why? Because Happy Camp has a multitude of faces, and brings you back to a rural American lifestyle. Happy Camp is a small, rural town. Small enough so that neighbors know one another, where one encounters familiar faces at the post office or the market. It is a town where citizens voluntarily staff our fire department, ambulance crews, are working together to develop our city park, and govern our medical clinic. 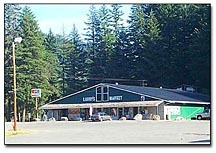 Happy Camp, while rural, is a commercial center for a 65-mile corridor of the Klamath River. Accessible by highway and air, it has stores, schooling, medical facilities, and basic commodity needs of residents. Happy Camp is scenic. Nestled on the banks of the mighty Klamath River, a major river of the west coast, it is in a pristine setting that offers a variety of wildlife and natural beauty not found elsewhere. 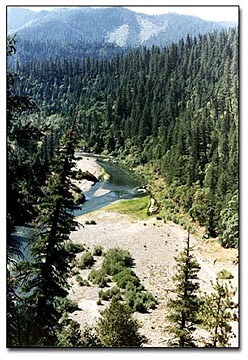 The Klamath River is a designated “Wild and Scenic” river, and the Klamath River Highway a designated “scenic” route. 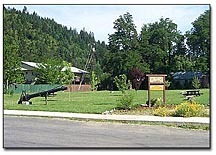 Happy Camp is a forest town, situated in the midst of the Klamath National Forest, where most of the surrounding mountainous land is U.S. Forest Service lands, while the river valley lands are predominately privately owned. This unique forest provides mixed conifer stands with mixed hardwoods and complex plant and animal life. Happy Camp is also a river town. From its origin above Klamath Falls, Oregon, the Klamath River has cut a tremendous gorge through the Siskiyou mountains to create the Klamath River Canyon. A widening, where the river makes a turn to the south on its way to the sea, provides the setting for Happy Camp, on the site of gold discoveries, and before that, a village of the Karuk Indian Tribe. Happy Camp is also a retirement town. An entire segment of the community population has chosen it as home for their senior years. Often, our most active citizens. Having fled urban areas, they seek to preserve small town qualities, but, having grown accustomed to urban conveniences and amenities, seek responsible planning and zoning, cultural opportunities, and good public services. Happy Camp is a town for young people. It provides schooling for a large rural area, yet offers small class sizes and opportunities for students that cannot be found in large city schools. While Happy Camp has suffered an overall decline in population in recent years due to timber cutbacks, it is just beginning a growth period as it is discovered by families seeking a safer, rural lifestyle. Happy Camp is a recreational paradise! From quiet activities such as animal/nature watching, picnicking, rock hounding; to river and water sports, horseback riding, golfing, hiking, biking, rafting, gold panning, and snowmobiling, cross-country skiing at the Sno-Park in winter, there’s a never-ending abundance of recreational activities to satisfy all appetites. Read on to find out all about it! Above all, Happy Camp is a friendly town. Fellow residents smile and wave, whether they know you or not, and people care about each other. All you have to do is visit to be convinced. Make your plans now to visit so you can find the greatest secret on the west coast. It’s a small community called Happy Camp! Happy Camp’s location provides for a unique climate that is invigorating and refreshing, and conducive to a relaxing, but active lifestyle. It is far enough north to enjoy four distinct seasons, of a Mediterranean type. Springtime is intermittently rainy, with moderate temperatures, and beautiful, brilliant skies. Brilliant wild redbud trees are an early treat. Wildflowers carpet the area, and roads are lined with wild roses, Spanish broom, lilacs, sweetpeas, chicory, California poppies, Queen Anne’s Lace, dogwood, wild fruit trees, and many other blooms in turn, creating an ever-changing display of color. In the canyon below the community, full hillsides of wild lilacs in a wide range of color create a heady perfume for travelers. Wild roses line the banks of Indian Creek Road and the open fields north of town. More exotic blooms are evident as you venture into the mountains in any direction, with many native species that are unique to the Siskiyou Mountains. Summertime brings warm days and cool nights for sleeping comfort. Days are long, with full dark not coming until about 9:30 p.m. at their longest. Temperatures range from the 80’s to high 90’s (with low humidity levels) during the day, and nighttime temperatures most often in the 40’s to 50’s. Rainfall is very light during summer months, usually just a light shower or two each month–just enough to settle dust and keep things green. Breezes are light and cool, and the wildflower parade continues throughout most of the summer, especially along the creeks, which are slightly higher in elevation. Gardening season is long enough to provide for a full vegetable garden, with prolific yields in most crops the norm. Blessed with an abundant supply of water in most years, Happy Camp has never had to ration water. Deer are seen grazing all along the river (even in town). Elk can often be seen near Sulphur Springs, and the Happy Camp bears can be glimpsed crossing the highway or the river, once in a while. August brings blackberry picking time, and the berries are abundant and tasty here. The high water table brings large, juicy berries in every sunny spot along the highway and river. Wild grapes and fruit trees (apple, plum, and pear) are in also found in abundance, laden with sweet, juicy bounty. Fall brings a crispness to the morning air as days shorten, while daytime temperatures still range into the upper 60’s and low 70’s. Nighttime temperatures drop into the 30’s as winter approaches. The wildflower display is over, and it is time for the trees to put on their magnificent display of fall color. The drive up the Klamath River Highway brings a new picture postcard into view at each turn of the road with colors ranging from brilliant yellow to deep magenta and purple, and small wisps of cloud hug the mountainsides, clinging to the deep green of the pine, fir and cedar. 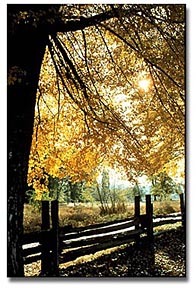 Fall rains become intermittent and more frequent as the season progresses. Winter usually brings a few light snowfalls that don’t last long. Enough snow to look really pretty, but not enough so that you get tired of it! A drive up the creek roads will find more, and the higher mountain tops surrounding the community often have a mantle of snow. Most years, even if there’s no snow in town you can drive just a few miles up Indian Creek to cut your own Christmas Tree in the snow. Rainfall has averaged 55 inches per year in the last ten years, with most of it coming in the fall and winter months, so rainfall is fairly frequent, keeping temperatures milder than further inland. Daytime temperatures are often in the 40’s to 50’s, with nighttime temperatures varying from the teens and 20’s in clear weather to 30’s and 40’s in rainy weather. Long the home of the Karuk Indian Tribe, white trappers first descended the Klamath River canyon in search of beaver, and then gold. Originally settled as a gold mining town, numerous families in the area trace their roots back to those days of the 1860’s, and Karuk families trace theirs back even further. When gold mining on a commercial scale waned in the early years of this century, the local economy turned to its most plentiful resource, timber. The economy leaned heavily on timber until the decline of this last decade, with the lone remaining mill closing in October, 1994. An increase in tourism has been seen during the last decade, remarkable since the area is relatively unknown. While the decline in the timber industry struck a blow to the local economy of Happy Camp, residents have been pulling together to combat the effects. Tourism is on the increase, with bicyclists, small-scale gold miners, fishermen, river rafters and hunters furnishing the majority of business at this time. A large tourism marketing project for northern California tourism will include Happy Camp interests, and is already underway, in addition to the efforts of residents groups. Economic guidelines furnished by the county put the per capita income at $26,000 in 1990, the latest records available. Other projects are now underway to bring diversity and stability to the local economy. Projects have been funded to explore diversified wood products manufacturing and the location of a government youth camp in the area is well underway. And, not stopping there, continued efforts are underway to bring more funding, more light industry, more cottage industry to the community. The Happy Camp area is already a haven for artists and artisans in many fields. The Karuk Indian Tribe now has a business development center, funded by the Small Business Administration (SBA) to help small businesses increase their potential, and allow new ones to form with a large opportunity for success. A Community Development Corporation has been formed by the Karuk Tribe and is working to aid in the formation of new businesses. Funding has also been received, and work begun, on a Community Computer Center, to further education development at the high school level through college courses, and to aid businesses, families, groups and residents of all ages. Property values in the area, while lower than most of the state, are already on the increase, and will continue to grow with the community. While it will probably always remain a rural community, Happy Camp is on the rise, as its residents rally to provide themselves and newcomers with a community they can be proud of, in a pristine setting. The cost of living in Happy Camp is still low, even for Siskiyou County, and is a consideration. For such a small population, the well-rounded business community of the area is a great asset. Area businesses include a well-stocked grocery store, card-lock gas station that you must have a credit card to operate, or a credit account in town; a tire store, an auto parts store an auto/body paint shop, an auto repairgarage, a hardware store, a laundromat, a pharmacy, a mercantile offering a wide variety of goods, two restaurants, a hamburger stand, a video store, a liquor/sporting goods/arcade, a pizza place, an office supply store, a used furniture store, used book/clothing store, several beauty shops, varied guide services, motels/resorts/cabins, several RV Parks with full hookups, one lounge, a pet groomer, a gift/collectibles/antique store, a real estate agent, a car wash, a book publisher, a magazine publisher, a computer software business, two rock shops, a small-scale mining organization, a winery, a screen-printing business, horse/horseback riding and training, and numerous small cottage industries such as handcrafts, cake decorating, quilting and upholstering, gold nugget jewelry, Indian and/or silver and gemstone jewelry, weaving, mushroom growing, yard services, rafting services, woodcutting, and housecleaning. One of our greatest natural resources is the Klamath River, which offers an abundance of recreational opportunities all by itself. The river flows through the southern edge of Happy Camp in a westerly, then southerly direction, entering a narrower canyon beyond the western edge of town. Due to small human population in the area, the river abounds in wildlife. California Black Bear, mountain lion, Pacific Fisher, elk, blacktail deer, otter, raccoons, skunks, fox, coyote, and steelhead and salmon fish are among those most often seen. Blue heron, ducks, geese, owls, hawks, osprey, and eagles are just some of the many birds frequently seen in and around the river. People utilize the river for recreation in many ways. Anglers count it among the great steelhead and salmon fishing rivers of the west. It is fished from shore and from drift boats. 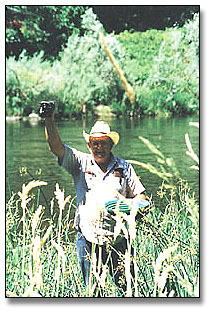 In 1994, salmon numbers were up dramatically from the previous few years, indicating that the salmon will continue to increase, perhaps due to new safety measures. Rafting and kayaking parties of a few hours up to several days are numerous during the days of summer months, as they traverse placid areas mixed with rapids rated high enough to challenge the most daring. Rafters come from all areas of the United States to meet the challenge of the river, yet novices can have an exciting, but perfectly safe outing of several days duration. Rapids of all classes are found on this section of the Klamath. Guide books and guide services are locally available for information and trips. Small-scale gold miners of all ages, backgrounds, and skill levels are often seen during spring and summer, as the river gives up just a small portion of her rich bounty of gold each season. Many are retired or semi-retired people seeking a rewarding pastime that is physically active. Others are families looking for an activity they can all participate in and enjoy in the great outdoors that is healthy, active, and fun! Up to $300,000 per year in placer gold is sold in the area, and gold prospectors come from as far away as Germany and Sweden in an attempt to wrest the golden treasure from these waters. 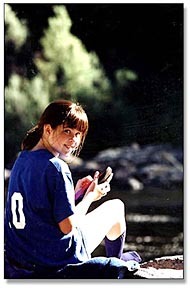 Indian Creek flows into the Klamath River in Happy Camp, and as it rushes down from its headwaters in the Siskiyou Mountains to the north, it provides a beautiful setting for camping, fishing, rockhounding and gold prospecting. Indian Creek’s south fork has a rich deposit of a local “jadeite”, or jade-type rock known worldwide as “Happy Camp Jade” that is much prized by rockhounds and jewelers. While the mine is privately owned, pieces of jade in many shades from palest green to almost black are commonly found in Indian Creek, and in the Klamath River. Especially prized are pieces with veins of gold running through. Garnets are also abundant in the pebbles of Indian Creek and the river. Numerous U.S. Forest Service River Accesses on Indian Creek afford lovely, quiet picnic areas, where wildlife, birdlife, and abundant wildflowers abound in spring and summer months. Twelve miles north of Happy Camp, West Branch Indian Creek Campground (a U.S. Forest Service facility) provides a lovely, quiet camping area on the west branch. Elk Creek flows into the Klamath River from the south, about 1/2 mile west of town. This creek furnishes drinking water for the community, and abundant fish life for anglers. Somewhat more difficult to access, as the canyon is steeper, Elk Creek offers its own unique opportunities for recreation. At its confluence with the Klamath, and just below 5-mile bridge are swimming holes frequented in summer, where the water is always cool (you’ll need to check that you’re not on private property, however). Cool and shady during summer months, Elk Creek Campground, a private campground, is just a little way up the road from town and has all facilities for campers. Sulphur Springs Campground, a U.S. Forest Service Day Use area 13 miles up Elk Creek road provides a most serene and beautiful setting for picnicking, with barbecues and tables. Rock-lined walks, in use for many, many years, lead you along the banks of the creek to wander under the trees. Sulphur Springs itself offers a warm, healing, sulphurous bath at the edge of Elk Creek, any time of year. 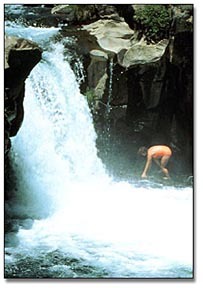 Just above the campground is a lovely waterfall and grotto for swimming. This area was in use by the Karuk Indians, long before being settled by any white man. Just two miles above the campground the road is closed to motor vehicles, and this area, a former elk preserve is now rich in elk. Located north of Happy Camp in the Siskiyou mountains, Kelly Lake provides trout fishing for residents and vacationers, alike. The idea for this trail was conceived in the 1930’s, and it is now a horseback and hiking trail that extends from Mexico to Canada. Crossing the Klamath River at Seiad Valley, just 18 miles east of Happy Camp, the trail can be accessed and hiked north to the Oregon border and beyond, or south to Castle Crags, below Mount Shasta. Happy Camp has an active Archery Club to provide enthusiasts with sport, and novices with instruction. During deer and bear hunting seasons, the archery hunting seasons are just as enthusiastically greeted by residents as the rifle hunting seasons. A very popular hunting area, local mountains provide excellent hunting for all species, in season. Upriver from Happy Camp about 45 miles, in the small community of Klamath River, the Eagle’s Nest Golf Course borders the river, and provides a 9-hole golf course for the golf enthusiast, open year-round. Are at their best in the Happy Camp area. In addition to the Pacific Crest Trail, many other nearby hiking trails, of various degrees of difficulty, are available to hikers. Books outlining these trails, and Forest Service maps, are available locally. In town, the “Happy Camp Trail,” that begins on the far side of the Klamath River bridge, affords an easy hike to spectacular views of the town, the river, and the surrounding mountains. Are available for horseback or llama pack trips into the Marble Mountain Wilderness, or other mountain areas. They are also available for drift boat fishing and rafting, offering a variety of trips to a wide selection of areas on the Klamath River. into the Klamath River. Most of the creeks, however, have deep bedrock, and do not carry as much gold in the overburden as does the Klamath River. What this means to the casual, or novice gold panner is that one is more likely to find gold while panning on the river than on the creeks. Gold is generally easier to locate in this area than in most other areas of California, due to the easy access, the size of the river–which maintains shallow gold that is easy for the smallest-scale or beginning prospector to find, and, due to the remoteness of the area, it has not been worked nearly as heavily as other areas of the state. Many locations in this area are under legal claim, however, and it’s important not to pan on someone’s claim. Information on open areas, or where casual panning can be done is available in Happy Camp from The New 49’ers’. They can also provide instruction, if needed. Workshops are held during late spring and summer months. In the Happy Camp area is on the increase in recent years with the development of mountain bikes, and with the formation of clubs which are looking for biking challenges. Often seen on the Klamath River Highway in summer months, the road offers challenges to the bikers, and the continuing development of biking trails will accommodate these increasing numbers. Are also to be found in the area. Just 25 miles north of the town on Indian Creek Road, the “Sno-Park” offers opportunities for snowmobiling and cross-country skiing. Downhill skiing is available at Mt. Ashland, to the north on I-5 just into Oregon, and at Mount Shasta, both popular ski resort areas. At the present time, the Sno-Park is not directly accessible by auto in the winter months. The road is not cleared on this side of the mountain. Are available within the confines of the community. Gail Zink Memorial Park, next to the Happy Camp Elementary School, is maintained by the Happy Camp Community Services District (HCCSD), and offers a beautiful grassy area, tables and barbecues. The Happy Camp Community Park, just down the hill, also under the auspices of HCCSD, now offers a lovely setting for group outings. Situated at the river’s edge, it includes ponds, shade trees, restrooms, a new park pavilion for dances and concerts, and grassy reas. Playground equipment is in the development stage. Development of a new “mini-park” in Happy Camp’s “Old Town” is underway. While Happy Camp cannot offer crowds, streetlights, long waiting lines, or a large populace, its setting among magnificent natural resources and the unhurried pace of life are just compensation for those who choose to live here. Here the air is sweeter; a unique microclimate allows residents to grow more varieties of plants than can be found most anywhere else; the natural beauty and serenity of the area are unmatched in the hurried pace of life that rushes past across the mountains in every direction, leaving this community to provide a unique opportunity to raise a family, live out your “golden years,” or have a unique vacation in “God’s country,” almost untouched by the rest of the world.